Lulu is excited about her playdate with Finny—and especially excited about Finny’s Rolly-Roo. In fact, Lulu loves the toy so much that she . . . kind of forgets to play with Finny. So when the girls accidentally break the Rolly-Roo, will Lulu realize her mistake? 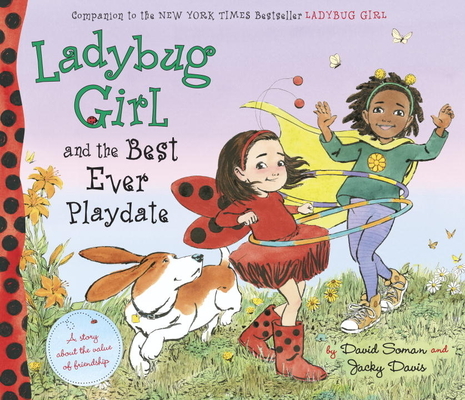 In this compassionate and charming story about the value of a great friend, Lulu and Finny repair the broken toy, and soon forget all about it, blasting off on new imaginative adventures together as Ladybug Girl and Grasshopper Girl. Great for fans of Fancy Nancy, Olivia, and Knuffle Bunny, this beloved series is celebrated for its gentle and authentic look at kid-truths. David Soman and Jacky Davis are a husband-and-wife creative team. They write the Ladybug Girl books together and Mr. Soman illustrates. The books are inspired by their own children and family experiences.